Samsung Galaxy Tab Pro 12.2 is a powerful tablet released back in the year 2014, packing an extremely powerful Octa-Core processor (as a matter of fact it's really a Quad-Core speeding at 1900 megahertz and an extra Quad-Core running at 1300 megahertz), an enormous 12.2-inches capacitive touch-screen, and 2 cameras, an 8 MP back-facing camera and a 2 MP front-facing camera. That's everything we have to say? No, it's just the introduction of a much deeper review. This tablet has an amazing design, with a thickness of just 0.31 inches. Whereas the Tab Pro 12.2 is only 11.64 inches long and 8.03" wide, it still manages to hold a 12.2 inches screen. This device feels much lighter than what one would expect from a tablet this size. Samsung designed the Samsung Galaxy Tab Pro 12.2 with a very good 12.2 inches display, and a resolution of 1600 x 2560 , making everything look very good. Its display uses Super Clear LCD capacitive technology, and allows multi-touch for gestures like pinch and zoom. Samsung decided to power this device with an extremely fast Octa-Core processor (composed by a Quad-Core running at 1900 MHz and an additional Quad-Core running at 1300 MHz), included in a Samsung Exynos 5 Octa system chip and a great 3 GB RAM. Graphic calculations often eats lots of processing time, so the Samsung Galaxy Tab Pro 12.2 has an extra 600 MHz ARM Mali-T628 MP6 GPU to take some work out of the processor. 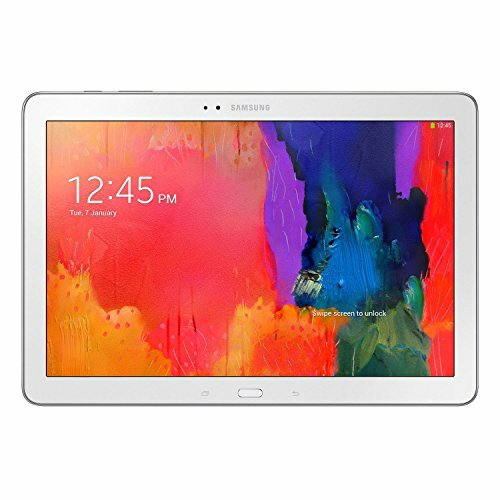 The Samsung Galaxy Tab Pro 12.2 has a 64 GB huge internal storage memory and an SD extension slot, which allows the user to install hundreds of apps and even the heaviest games currently available without having to worry about how much storage is left. The Samsung Galaxy Tab Pro 12.2 features two cameras, an 8 mega-pixels back facing camera and a 2 mega-pixels front-facing camera. It is also able to shoot videos up to 1920x1080 (Full HD) at 60 fps. This tablet also counts with some useful characteristics like auto-focus, flash and geo tagging. This tablet counts with Wi-Fi capability (which it can share with other devices acting as a mobile hotspot), LTE 4G high speed internet connection and also HSPA+ data connection, a slower 4G network or the fastest 3G connection type, using HSDPA and EDGE technologies. The Samsung Galaxy Tab Pro 12.2 works with a SIM card to use GSM services. This tablet also includes many interesting features like Bluetooth (provides communication with other tablets and accessories), GPS, Infrared Transmitter and NFC (to trigger actions, transfer data or make payments by holding your tablet close to another NFC device or tag), and multiple sensors like Light Sensor, Accelerometer, Gyroscope and Compass. This tablet packs a 9500 mAh amazing non-removable battery providing this device an impressive battery duration. An issue to evaluate is that the Samsung Galaxy Tab Pro 12.2's battery isn't replaceable	so you can't buy a new battery when it begins losing capacity, though with such a great capacity you will probably discard this device before it becomes a real problem. This tablet is being sold for only $ 249, which is a real gift for such a great tablet. No matter whether you are looking for a tablet majorly for internet broswing and social networks, want this tablet to play games, are an amateur photographer or want a work tablet, this tablet is definitely the right choice for you.